A proud native of Washington, D.C., Salima Appiah-Duffell calls her new art library roving position the beginning of her “second career.” She splits her time between the Smithsonian American Art Museum and National Portrait Gallery Library and the Hirshhorn Museum and Sculpture Garden Library. Prior to coming to the Smithsonian, Salima served as a Peace Corps volunteer in Malawi and worked as a program analyst at the Department of Housing and Urban Development. 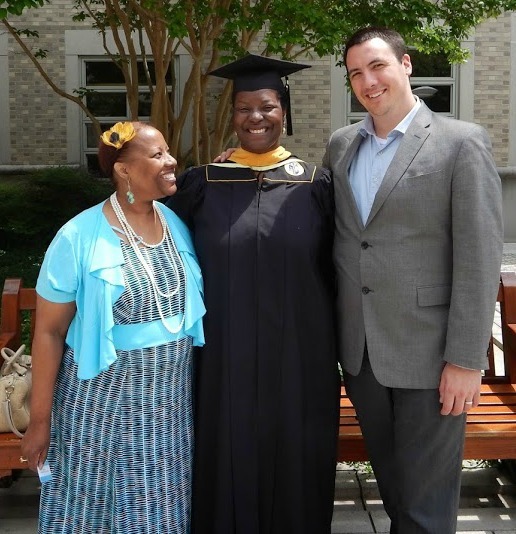 Salima earned her bachelor of arts in peace and justice studies from Tufts University, and recently graduated from Catholic University of America with a master of library and information studies, specializing in cultural heritage and information management. Upon entering her first graduate year at Catholic, Salima recalls picturing a job at the Smithsonian Libraries as “the dream” and feels that the stars aligned for her to join our staff. As this is Salima’s first professional library job, and she is intent on learning everything she can, including developing reference, outreach, and preservation skills. Salima poses with her mother and husband at her graduation from Catholic University. In her spare time, Salima enjoys reading, writing, dancing, and live theatre and music. A D.C. expert, she loves wandering around Mount Pleasant and Eastern Market and enjoys local gems such as macarons from The Sweet Lobby on Capitol Hill, burgers form Good Stuff Eatery, and books from Politics and Prose. She counts several places in D.C. as favorites: the Kogod Courtyard, U.S. Botanical Garden, Lafayette Park (where her husband proposed), Malcom X Park, the Tidal Basin, and the walk between Union Station and Capital South at sunset. In the future, Salima hopes to continue to develop her library career at the Smithsonian in a capacity where she is able to interact with the public. She describes connecting patrons with the incredible treasures the Smithsonian Libraries holds a great joy. Previous Post Adopt a book this Black Friday!